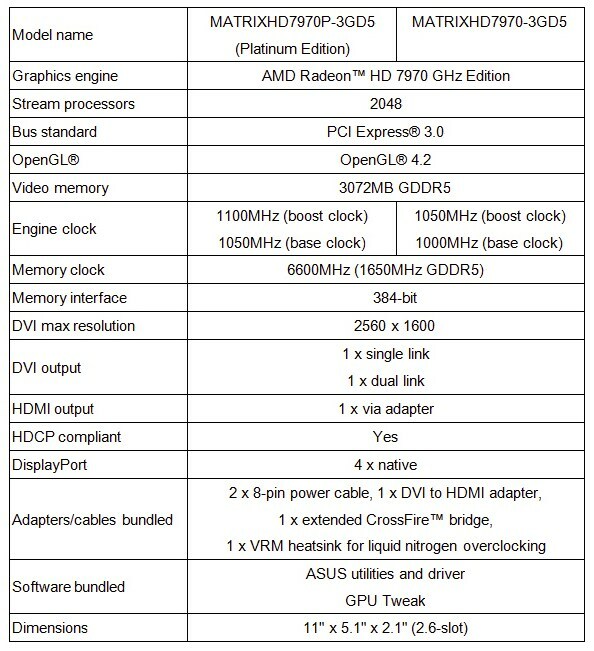 ASUS just announced the new high end single GPU graphic card based on AMD Radeon GPU, the ASUS Matrix HD 7970 Platinum, considered as the top flag ship of current ASUS's AMD products powered with the latest AMD 28nm "Tahiti" based HD 7970 GPU with the magic touch from ASUS. 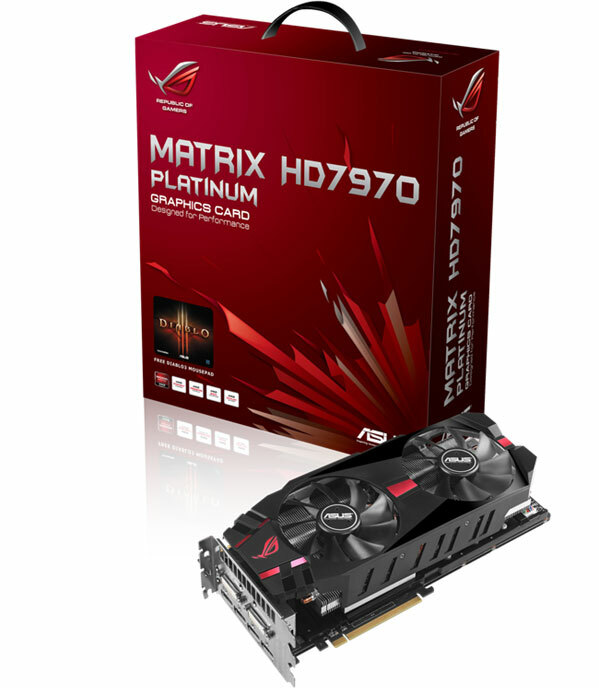 After the base model here is the Platinum edition of the Matrix HD 7970 line, specifications set are 1050Mhz as a clock speed for the core with 1100Mhz when in boost mode, with a 3Gb of GDDR5 running at 6Ghz, total of 2048 stream processors running, 384 bit as a bus line, all this horse power must require a solid power regulation, ASUS put 20 solid phase VRM that draws power from two 8 pin PCIe power connectors, check out the table bellow for more specifications. the Asus Matrix HD 7970 Platinum also comes with great features like the manual LLC factor tuning, (fine-tune protection against V-droop during voltage-sensitive overclocking sessions), VGA Hotwire for better voltage tuning and more, in addition to an enhanced Asus software voltage and OC tools, the price tag for this video card is from 490$.